After secret shopping our competitors, we found our sparklers to be the brightest and best quality! These 14-inch gold wire sparklers are beautiful for weddings and guests will love participating in your wedding send off. Best quality and best value available for your special day. Favorite 14 Inch Sparklers for Weddings! Best Quality and Best Value: The cost per wedding sparkler will fit the budget of any bride. This is one item on your wish list that you just can’t leave out! Each order includes 12 boxes of 6 wire sparklers (for a total of 72 sparklers) packaged in attractive white boxes with grey and silver print. Our 14 Inch Gold Wedding Sparklers will burn for about 1.5 minutes. Set the Scene for Beautiful Wedding Photos: So many brides tell us that one of their favorite wedding photos – if not their very favorite photograph – is from their sparkler send off! Sparklers create dramatic lighting and a very special moment as friends and family join together to say goodbye. Just coordinate with your wedding planner and enjoy a fun grand exit from your wedding ceremony or reception! How Many Sparklers Do You Need? We recommend ordering enough for 2 sparklers per person. Plan to light the first sparklers with a butane or barbecue lighter (a match isn’t strong enough). Ask guests to dip unlit sparklers into a lit sparkler to pass quickly through the crowd. Sparklers can be lit very quickly if guests are lined up and ready for the grand exit. Guests Have Fun Participating in Send Off! 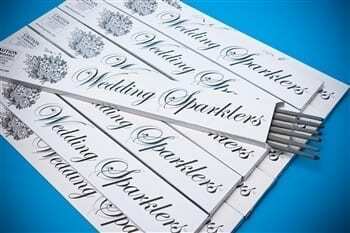 Our 14 Inch Gold Wedding Sparklers are a wonderful way to add glamour and excitement to your grand exit. Guests will be thrilled to participate in your send off. And with a little coordination with your photographer, the energy and dramatic lighting of the moment creates amazing photos with sparklers. Friendly Reminders: All sparklers are recommended for outside use only. Hold sparkler at arm’s length when burning the sparkler. Adults should supervise children, not recommended for children under age 8. Be sure to have a bucket nearby filled with water or sand to dispose of used sparklers to prevent burns or injuries. We loved the Sparklers! They were perfect for the exit from the Reception! Thanks for all your help!! We wanted to have a fun, unique send off for my daughter’s wedding and decided that sparklers would be perfect! I was pleased with how fast the order arrived and how beautiful the sparklers were! Thanks so much for being our go-to on our big day. The sparklers were beautiful, and I’m so glad that we chose some good Texas ladies! Just wanted to take the time to thank you for working with the short notice for the sparklers. We had a beautiful send off and the sparklers helped the evening be more magical! We bought the sparklers for our wedding, August 14th, 2013, in Judsonia, AR. My husband, Caleb, and I each have three sisters that are the same age, so our sisters surprised us and wrote our new last name in sparklers! I did not realize that they had done this until I was looking through the wedding photos. Your sparklers helped us make some wonderful memories, as well as bring two families together! These sparklers were wonderful for our fantastic send-off. We had a last minute order and since we live in TX, we received them the next day. 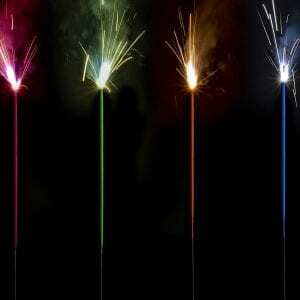 We were extremely pleased with the quality, efficiency and customer service of Buy Sparklers! I recommend them to all my friends who get engaged! We ordered the 14 inch sparklers for our wedding and the pictures turned out great! The guests loved them and they were long enough for our 2 year old niece to participate with adult supervision! After we left, the bridal party spelled out “WHOOP” since we are big Texas A&M fans and the pictures look amazing! Thank you for a great product! BuySparklers was easily the best vendor I chose for my wedding. Every response and effort was timely, and convenient for me. I was thrilled when I found out there was a pick-up option, because it just happens that they’re located in my city. Nicole was a pleasure to work with, and when I was running late for my order, she was accommodating and understanding. The sparklers were even better quality than I’d expected. I got the mid-size wedding edition, and they lasted just the right amount of time. My mom was ten minutes late to the ceremony, the mic didn’t work well, so no one heard our vows, my husband had a stomach ache, and I’m not sure we have any photos from the wedding. My wedding, like everyone’s, had things that made it a little different than I’d dreamed, but our exit was exactly what I’d always hoped, and the happiness I felt in that moment-seeing all our friends, cheering us on, in the yellow hue of the sparklers-it was magical. And that will stay with me forever. Everything that can go wrong, will go wrong at a wedding, but I’m thankful that BuySparklers was the one part of my wedding that went absolutely smoothly and gave me one of my favorite wedding day memories! So many things went wrong at my wedding, but the ONLY thing that worked as it should were the sparklers! Thank goodness the sparklers all lit and we had a fantastic send off. They were the only high point of my special day! This place literally has the best customer service I have ever encountered. I wanted some sparklers very last second and they called me after hours and shipped them the next morning. 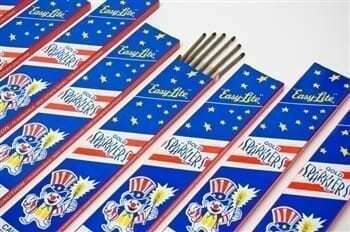 If I ever need sparklers again this is the place I will order from. Great prices too! 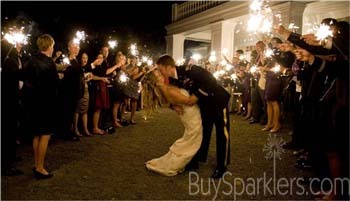 We love sending our clients to BuySparklers.com it is the only way to go! Reliable, and competitive pricing! Nicole Sparks and the team at BuySparklers.com are nothing short of AWESOME! 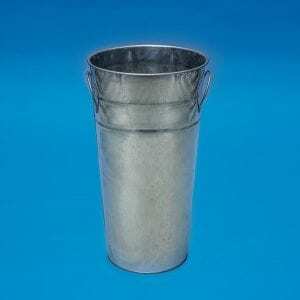 Great products, easy web ordering, and always there when you need them! I found BuySparklers the week before my wedding and was SO happy that they could get sparklers to me in time for my wedding. Ordering from this company was the only thing that went smoothly during the entire wedding planning. They made it so simple and my sparklers arrived as promised. I ordered the heart sparklers and loved them! They were the perfect addition to my wedding! I recommend this company to anyone who wants the job done right. I was in a bind and needed 144 wedding sparklers delivered in less that a week….Nicole calmed me down and made sure the shipment was sent right away. I appreciate the phone call to me and customized help. Much different than other companies that do this. Thank you very much Nicole. We had such a great experience with BuySparklers.com! They were so helpful and shipped my order extremely fast! 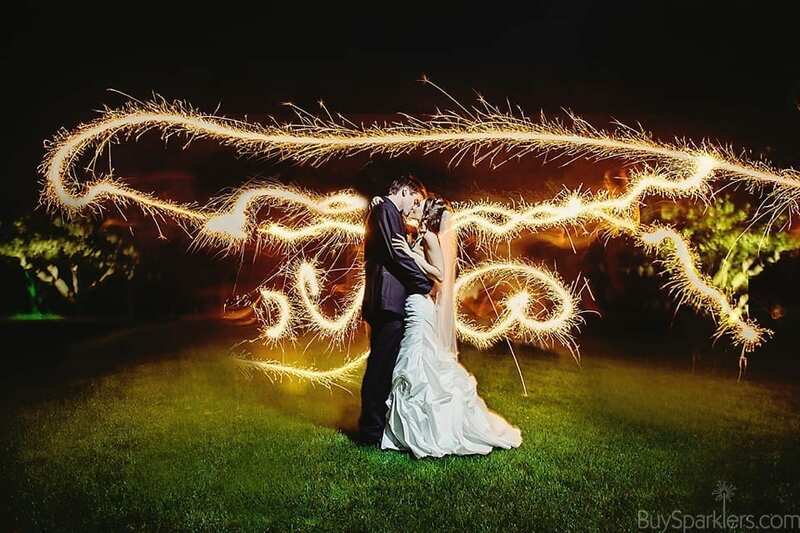 My favorite wedding portraits are the ones with the sparklers in them. The sparklers were a last minute decision and they really made my wedding pop!